Yesterday, thanks to the contributions of our members and others, we were able to purchase materials for our new work benches. We were also able to start building them. We have two down and two more to go. They look amazing and I know will be a great asset to the space. I uploaded some pics feel free to take a look. Or come and see them in person at our up and coming Open House on May 28(more details to come)! Fine work fellas; they look good. That card catalog fits almost perfect, very nice. Serendipitous or did you plan on it going there? Thanks, Josh. The card catalog fitting was a little bit of both. I got the idea when I was looking at the wall where the benches are going to be and saw the card catalog sitting on the floor. And when I finished up the plans for the new benches, I realized it should fit. 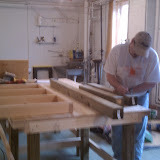 So, we built one of the benches without any plywood on its shelf and with its supports setup to hold the catalog. And the rest is history.